In the late 1940s, a sometime Columbia College student named Allen Ginsberg traveled to Denver to visit an acquaintance, Neal Cassady, who had been knocking around New York City. In Denver, Ginsberg and Cassady linked up with a mutual friend, Jack Kerouac, whose fictionalized account of that reunion was later recounted in On the Road. It was also in Denver that Cassady met Carolyn Robinson, whom he later married. From the beginning, Ginsberg was deeply infatuated with Neal, though their sexual involvement was not generally known until Ginsberg revealed it in a famous Paris Review interview in 1966. Until Allen's death in 1997, Carolyn Cassady managed to remain friends with him. Understandably, it was a friendship that had its complexities. Here, in an exclusive interview with American Legends, conducted via e-mail over the course of a year, Carolyn Robinson Cassady recalls Allen Ginsberg and the great Neal Cassady. Back in Denver in the 1940s, did you sense that Allen Ginsberg, Jack Kerouac, and Neal would one day be legends? AL: Over the years, Allen wrote a number of poems for Neal. CC: I guess I read some of Allen's poems to Neal very near the onset of our acquaintance in Denver, and he used to read them to me when he was with us in San Jose. One poem was called "The Green Automobile." I mean we both loved the guy, and I could understand Allen's feelings. We had that in common. Did Neal have a favorite among Allen's poems? CC: I do not know of any poem of Allen's that Neal favored. He would get the meaning, but Neal wasn't so much into poetry as was Jack. Neal had a logical and analytical mind. He liked philosophy and investigating the causes of events and actions. Practical, useful stuff. Were you jealous of Allen? CC: As in all cases of two who love one person, it is the loved one who makes the choices. It is stupid and ridiculous to place any "blame" on "the other." 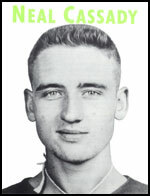 AL: In one Kerouac biography, Neal is quoted as saying that at one point, he felt an obligation to Allen to try to be gay. CC: It wasn't that Neal felt obligated to Allen (what a funny idea). It was his great compassion; he felt so sorry for Allen's suffering, he hoped he could alleviate it somewhat. If you read Allen's diaries or journals, it would seem he did so in spades, but I'm sure that is all Allen's fantasies. Neal told him that he didn't like "penises," and I am sure he was never the aggressor. Next question. In her memoir, Minor Characters, Joyce Johnson (who at the time she knew Jack Kerouac was Joyce Glassman) writes that a Barnard friend, Elise Cowen, was very attracted to Ginsberg. CC: He wallowed in his image. Poor guy was so basically insecure, he had to build up an enormous ego and chase around the world after applause. I told him that until he could believe the accolades and himself worthy of them, he'd keep doing that--which he did. AL: Did Allen discuss his radical ideas with you? CC: He didn't talk politics or anarchy with me, knowing I am so opposed to both. He only talked to me about his lovers in later years. Talk was mostly about literature or life plans or Neal. AL: In the 1960s Allen Ginsberg became a symbol of the drug culture, especially LSD. CC: When Ginsberg was in his twenties, I think I only saw him high on pot or benny. Without such, he was thoughtful, serious, sometimes morose and depressed. When high, he was gleeful, loud, boisterous, silly. In later years, after the Buddhist influence, he was calmer, kinder: His ego was growing by leaps and bounds--although the underlying insecurity was still there. AL: Did Allen admire other Beat poets? CC: Allen may have talked about poets within my earshot, but I doubt I'd have cared. I knew Whelan, Lamantia, McClure, but not Rexroth. I don't like their sort of poetry, so I didn't read much of them anyway. AL: After Neal's death, did you continue to see Allen? CC: Whenever he came to the Bay area, he would get in touch. He was very nice to me until the last years of his life when his old resentment surfaced. One of his last poems begins, "Why do I still resent Carolyn?" AL: Did you lose contact after you moved to England? CC: Whenever he'd come to London, he'd call and invite me to whatever performance he was doing and talk to me afterward. This was to get another pair of clapping hands--mostly because he'd go back to being rotten to me otherwise. AL: When did you see Allen last? CC: In New York, about a year before his death (in 1997). He pushed a camera in my face the whole time which I thought a bit rude, but that's Allen. I'll always love him--sort of like a member of the family.